I have noticed that Rafael Nadal had more points in Race rankings than in world rankings in several recent editions of ATP rankings. As far as I know, the race rankings are based on the tournaments from the current calendar year, whereas ATP world rankings are based on the tournaments from the last 52 weeks. So the latter includes longer period. How is it possible that a player has more points in the race rankings? Are there different rules for which tournaments are countable for these two rankings? For example, as of August 19, 2013, Nadal had 9010 points in the race rankings and 8860 points in the world rankings. You can check this on Wikipedia (here and here or in the Race to London rankings and ATP rankings published on the ATP website. So in this particular case, the difference seems to be that 150 points from the tournament in Viña del Mar in February 2013 are included in Race to London rankings, but not in ATP Rankings. I do not know whether it is possible to somehow find ranking breakdowns from the past, but according to this blog post Vina del Mar was included on February 11th; but this was before the tournament in Sao Paolo. He had 5550 points on February 11th (after Vina del Mar) and 5755 points on February 18th (after Sao Paolo). Maybe the rules about number of required ATP World Tour 500 series tournaments could explain this? According to Wikipedia: It is mandatory for leading players to enter at least four 500 events, including at least one after the US Open; if they play fewer than four, or fail to play in one after the US Open they get a "zero" score towards their world ranking for each one short. So, to determine a tennis players ranking, their best 18 tournament results are counted (19 if the player made the previous year's masters cup). 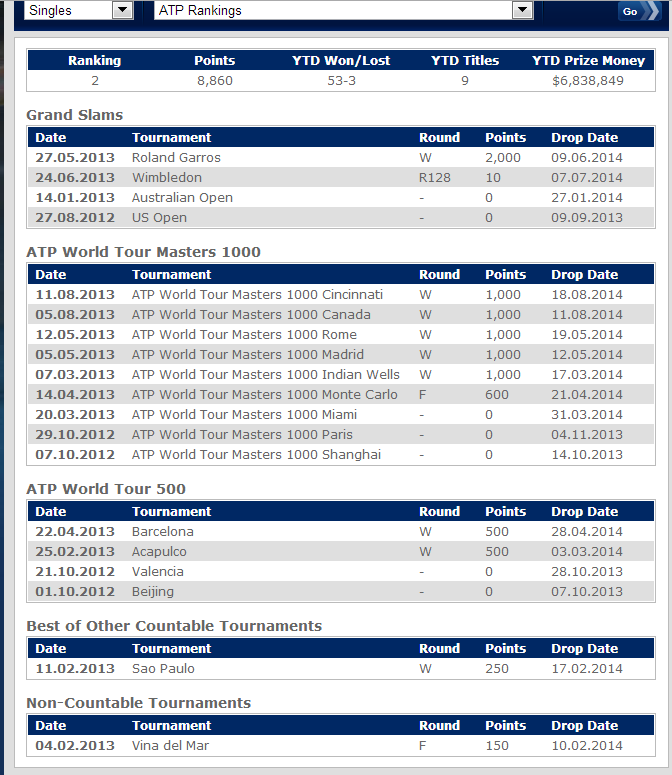 12 of these 18 events are mandatory (4 slams, 8 Masters Series) - they are counted first. This leaves a further 6 tournaments to be counted and they are counted in this order: first, the one optional Masters Series tournament (Monte Carlo), then any ATP 500 level and Davis Cup matches. If there are any countable tournament results left after this, then Olympics (if applicable) and the best ATP 250 results make up the points, until 18 tournaments have been counted (19 for Masters Cup players). So in Nadal's case (keep in mind he didn't play after Wimbledon in 2012 so he missed a bunch of tournaments), it has to do with this rule, regarding which tournaments can count towards Nadal's ranking, since he is a "commitment player". See the 2nd question on the ATP's rankings FAQ page. In November 2011, the ATP Board passed a rule to allow more flexibility in which tournaments count toward the ranking of a commitment player in 2012 and 2013. Commitment players (top 30 in 2012 year-end ranking) can count their best six (6) results from ATP World Tour 500, ATP World Tour 250 and other events (Challengers, Futures, Davis Cup, Olympics) toward their ranking. To count their best six (6), players must have fulfilled their commitment to 500 events - 4 total per year (at least 1 after the US Open). So what was left out of this explanation was - that UNTIL a commitment player has fulfilled their commitment to playing in four 500 level tournaments for the year (with 1 being post US Open) - they aren't allowed to count points earned at lesser tournaments (such as Vina Del Mar, in Nadal's case). Once Nadal plays in four 500 level tournaments in 2013, he can opt to (but probably won't need/want to) use the points earned at Vina Del Mar. When a player fails to meet that four 500 level tournament commitment, they are assigned zero points from however many 500 level tournaments they didn't play in. This is referred to as the "zero point penalty" for tennis rankings. In Nadal's case, he only played in one 500 level tournament in 2012 (Barcelona) so he was assigned/given a result of 0 points from three other 500 level tournaments at the end of 2012 (even though he never showed up or played at them). In the first image you posted of the Rankings - you can see he has zero points for Valencia and Beijing, even though he didn't play in those tournaments (He added points from Acapulco this year - it replaced a zero point result from 2012). Once Nadal plays in four 500 level tournaments in 2013 (with at least 1 being after the US Open) - those Vina Del Mar points would be eligible or "countable" as it says on the ATP website. I'll add some passages from 2013 ATP Rulebook to complement jamauss' answer. The commitment for the commitment player is, the singles event of all ATP World Tour Masters 1000 tournaments for which he is accepted, the Barclays ATP World Tour Finals (if qualified as a direct acceptance or designated as the alternate) and four (4) ATP World Tour 500 tournaments, one (1) of which must be held following the US Open. For commitment and ranking purposes, the Monte Carlo Masters 1000 will be included in the minimum requirements for the 500 category. 2013 Davis Cup points may be counted as one (1) of the best of six (6) in the Emirates ATP Rankings, however, it shall not count towards the commitment requirement of a commitment player. See page 184 "Ranking Penalty." Commitment Players. 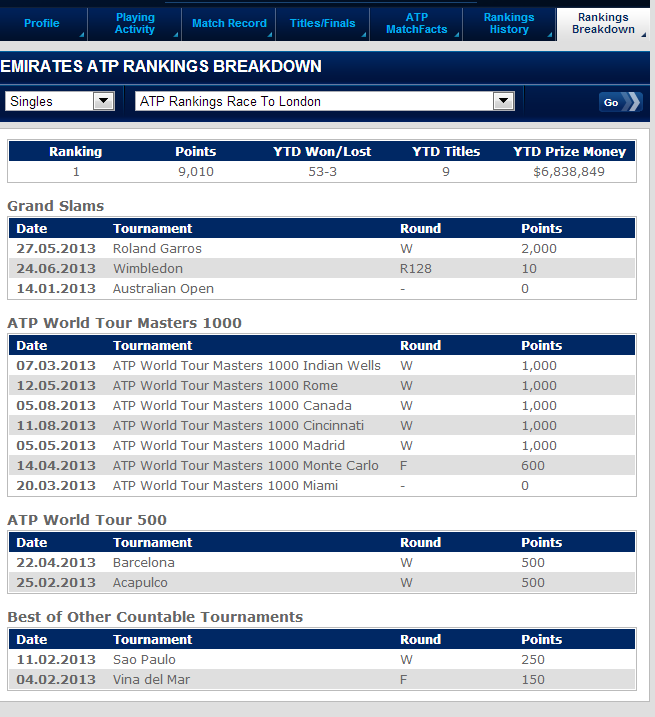 The year-end Emirates ATP Rankings is based on calculating, for each player, his total points from the four (4) Grand Slams, the eight (8) mandatory ATP World Tour Masters 1000 tournaments and the Barclays ATP World Tour Finals of the ranking period, and his best six (6) results from all ATP World Tour 500, ATP World Tour 250, ATP Challenger Tour and Futures tournaments.